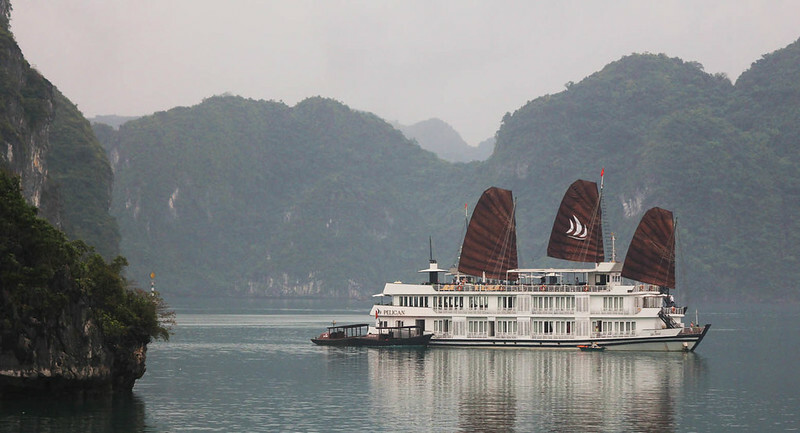 We booked a trip to Halong Bay through our hotel and ended up going with a package that cost $90 each for one night on a boat plus transfers from Hanoi and entrance into various sites in the National Park. All meals included but not drinks. We were told that water would not be included but it turned out that it was. We were picked up from our hotel at about 8:30am. It’s a 4 hour drive along a pot-holed, debris-strewn highway to Halong city. The mini bus was small and cramped. I’m tall (177cms/5 ft 9) but I’m not *that* tall. Like our visit the previous night to the water puppet theatre, I couldn’t help but curse the Vietnamese for their short stature. If you can avoid taking any sort of bus in this country my advice is to do it. We stopped at an elaborate tourist trap for a break on our way there and on the return trip. The bus driver dropped us all off with instructions to walk through the building and meet the bus on the far side in half an hour. We filtered through rooms of clothing, pottery, embroidery, food (chocolate bars for prices equal to Australia) and various tat. We looked around but spent most of our wait doing stretches and wishing we didn’t have to get back on the cramped bus. When we reached the harbour it was chock-full of tourists waiting to get on the 100+ boats. There were a lot of boats. All the boats where white, wooden and in noticeable disrepair. I’m starting to guess that paint is more expensive than gold in Vietnam, since no one seems to have used any in the last 30 year. Anywhere. Our boat was no more or less shabby than any other, but I was somewhat dismayed to noticed, as we approached it from behind, that one of the crew members was chucking garbage (a small amount and it might have been food but… urgh) out the back door. Charming. This tallied with the Trip Advisor reports I’d read about how rubbish-strewn the bay was and how little thought the locals put into environmental awareness. The boat was nice enough. The food was good, the other passengers friendly and our guide spoke reasonable English, even if he finished every sentence with a firm ‘Yep’, as though encouraging us to agree with him. It was odd. On the first afternoon we all got into the little boat and went ashore to walk up a lot of stairs and look through a cave. I was under the impression we were actually going kayaking and nothing else so I didn’t take my camera. AGAIN. The caves were enormous and colourfully lit and would’ve been more impressive if they weren’t full of tourists. But since I was part of the tourist horde I guess I can’t complain. My enjoyment of the place was mitigated by the fact that I don’t really like caves (all that weight above me..*shudders*) but at least these caves were huge. Small caves are on my opposite-bucket-list. As in, things I hope to never experience before I die. Due to the weather the view was monochromatic. The clouds through the mountains were pretty spectacular. After the caves was kayaking, which I felt slightly wary of. The last time I kayaked was in year 6. I recalled enjoying it then but I also recalled getting very wet, and I’d worn my sneakers on this trip and soaking shoes are a right royal pain. However I managed to get into the kayak, paddle around for half an hour with Luke and get out again without getting a drop of water on me, which is a lot more than I can say for Luke, whose pants were wet through. By the end I was really enjoying the kayaking, to the point where I was quite sorry that there is nowhere near Heathmont for me to continue doing it when I get home. I really like that feeling of slicing the paddle through the water and pushing myself forward. Being so close to the water is really lovely, too. I think the highlight of the day was getting to know Andrew, a kiwi of Chinese decent, who was traveling solo as part of our group. A great font of knowledge on all things travel-related and particularly on New York, where he lived for two years, he entertained us all evening with terrific stories and advice. We sat up til nearly midnight in the dining room of the boat and staved off any attempts by the crew to inflict karoke on a bunch of strangers. Whew! 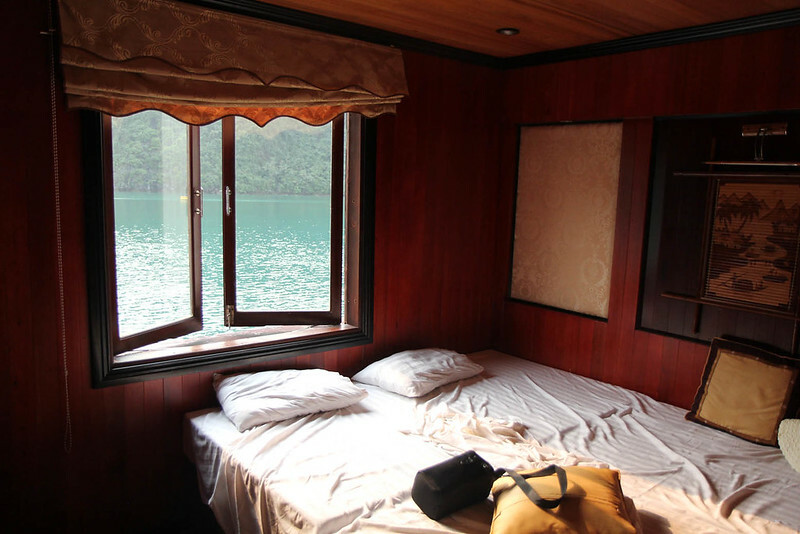 The next morning was a visit to a floating pearl farm. 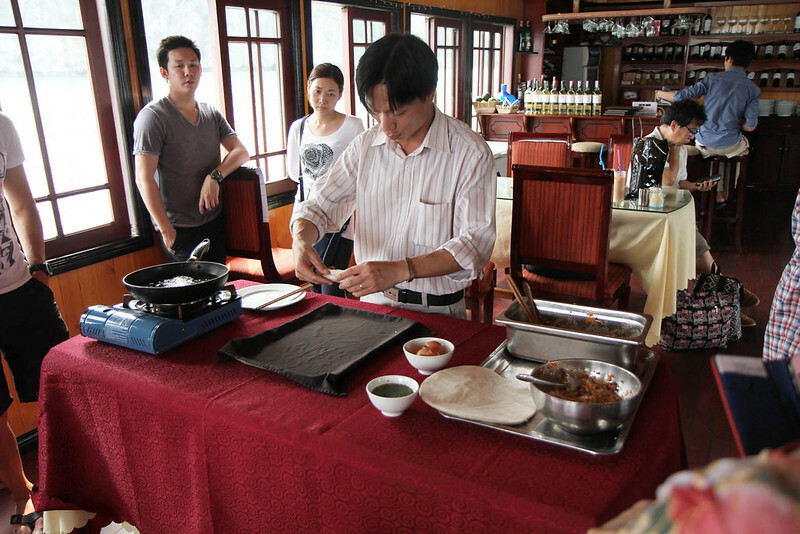 I found all the fish swimming around it more interesting than the pearl stuff, then we had a cooking lesson onboard. Simple spring rolls, deep fried and very tasty. Then we had lunch and cruised back to Halong City. I haven’t mentioned the scenery, which was what we were there for. It was exactly like the postcards, albeit very grey under the cloudy sky. I wished for some sunlight but it never appeared. A shame as the water would have been much more green and picturesque. The monoliths of limestone were fantastic and the layers of shapes receding towards the horizon and growing more pale as they went back was like a delicate ink painting. The bus ride home was as bad as the one there. The traffic was adrenalin-inducing. I just couldn’t watch the traffic and was extremely thankful that I am not one to get carsick, because I read my kindle nearly the whole way back. 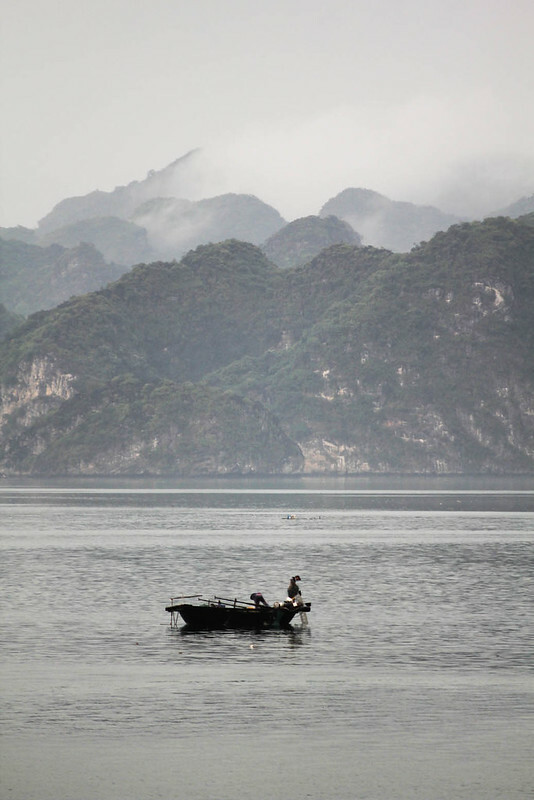 In summary, the highlights of Halong Bay were the natural features and the people we met. The rather glaring down sides were the crowds, the pollution and getting there. The pollution was a *real* downer for me. When you see so many plastic bags in the water and know that chances are they’re going to end up choking some animal it’s just plain depressing. If I could grab the Vietnamese government by the collar and shout one thing in its face it would be ‘CLEAN UP YOUR COUNTRY’. Seriously. It’s disgusting. In city areas there are street cleaners who get around really regularly but in the countryside there are fields of trash. On a high note, we were happy to be back in Hanoi and even in the same hotel room as last time. It’s amazing how little it takes for something to feel like home. We walked around the corner for dinner, had some vodka with freshly-juiced pineapple for $1.50 each and headed back to sit in our room and veg out. Tomorrow: the train! Shame about the grey skies, but it is still a must do when in Vietnam, we were very fortunate to have clear blue skies and spectacular sunsets the day/night we went. Agreed the pollution is pretty tragic and most of it unnecessary in Vietnam, it was the only thing I didn’t like about the place. Otherwise the people, fascinating sights and natural beauty (in some areas) were fantastic. Yeah, I guess if you bundle the water, street, noise and air pollution all together they are definitely the worst things about the country. I’m finding the humidity and heat pretty hard to deal with. We’ve had a few days of reasonable temperatures that have made it so much more enjoyable to get around and see sights. When we’re not dripping with sweat it’s much more fun! Hi Amanda! Its Chiara from Chatham! Got your email and thought I would suss out the blog.. it is amazing! Great photos too! 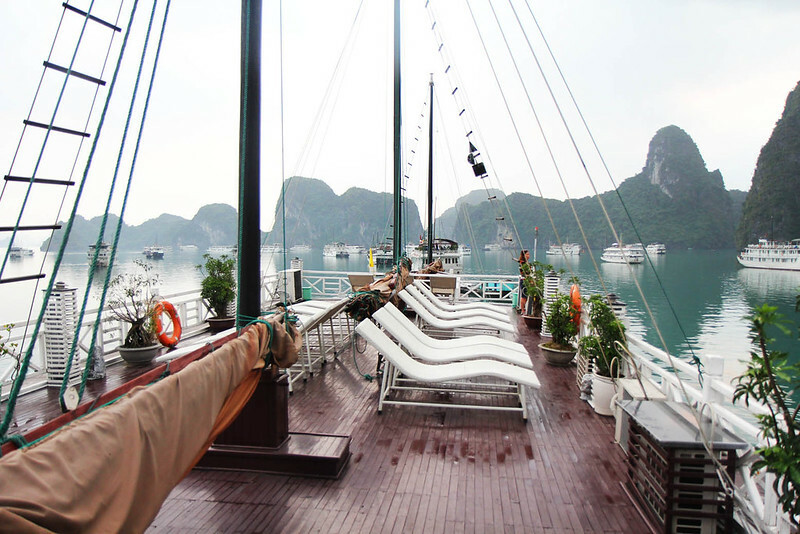 I went to Vietnam a couple of years ago and I think I was actually on that same boat in Halong Bay! So beautiful. The trip looks great so far! Thanks Chiara, glad you enjoyed reading:). What a coincidence! I hope you got better weather than we did on our trip;). Hope all’s well at work, I had a dream last night that one of my former students was here at the same hotel in Bangkok. I woke up feeling very confused!